Just the other day, there was an update news post that the same funders of the anti-GMO movement here in Hawaii had made considerable contributions to the Vermont labeling law defense fund. The trustees of the Ceres Trust, Judith Kern and Kent Whealy, donated some $50K to the fund, helping it top $160K. It is estimated that the state’s defense of this bad law will cost it some $8M! If people have so much money to burn, why spend it like that? Wouldn’t it be better spent to actually help people? It makes me pretty mad that these rich mainland folks drop money like rain to influence bad laws that ultimately take away from our taxes that should be used for us local folks first and foremost. They make as if GMO regulation is the ultimate priority here and our own politicians have been bought hook line and sinker to this message and it’s pretty disturbing to me. Can no one see the priorities here in our state? On a Star Advertiser poll done several months ago, one of the priorities that were recognized was that of homelessness. Just take a drive through Waikiki and our own capitol and you see why folks don’t like it. We’ve got sidewalks covered in makeshift tents, urine reeking parking lots, human feces in public areas, people lying on public property, and it all adds up to blight. In a city and state where our beauty is touted and people imagine paradise, we get nothing of the sort when you visit our state. The public bathrooms at our beautiful beaches are smelly with broken faucets, litter, and vandalism all over. Some bathrooms can’t even be used because its been taken over by homeless people living there and you get greeted by their lovely pit bull protecting them. 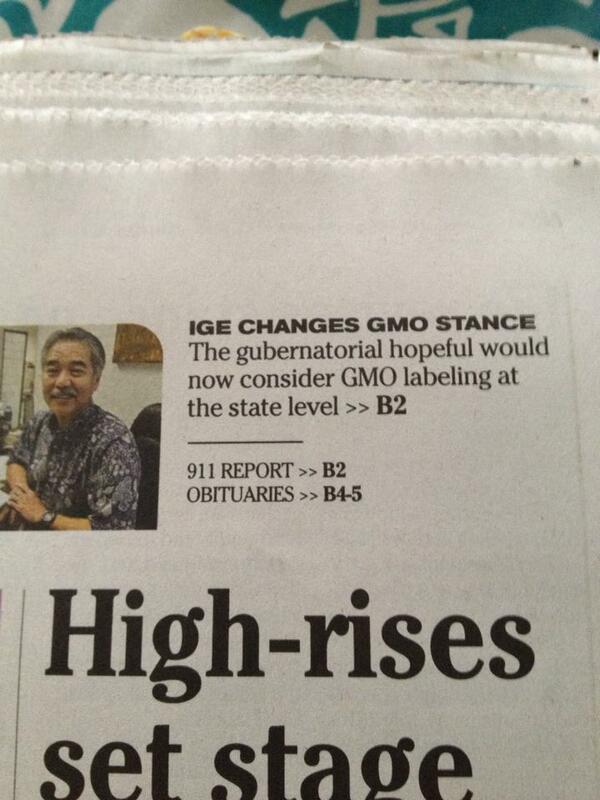 It’s a major problem and yet our politicians like David Ige and Russell Ruderman wants to push for GMO labeling and regulation. Forget what the city and state look like, they’ve got a different priority at hand. If you follow the issue with the public schools system, you also see that there are major problems there. Kids have to endure long hours of school in 95 degree classrooms only to have a fan blow hot air at them. Teachers spend their own money to add to their classroom lessons because there is no added funds. My mom, as a teacher, had to keep snacks on hand because many kids did not get enough food to eat and couldn’t concentrate in class. Screens and facilities are dirty month after month only to be cleaned when a church group rents the facility out and does the work for free. Some schools have no books and teachers have to purchase paper to create lessons taken from the computer instead. Our children should be our priority to politicians but some choose to shift the issue to GMOs because that is more important than what happens in our schools apparently. Another recent news story was that our local farmers are getting older and the younger generations aren’t willing to take over. The average age of farmers here are about 65 years old. Farming is such an attractive occupation lately when politicians like Brian Schatz, David Ige, Kaniela Ing tout home rule. Farmers not only have to comply with federal mandated laws like the burdensome Food Safety and Modernization Act, state laws, and now county level laws. Add on to that the increased cost of health care, taxes, property taxes, energy costs, and supply costs to the mix that really make farming a great job. These politicians somehow think that increasing legislation on farmers and their businesses are really going to make lots of people want to take on this risky and laborious job that has plenty of money to make. Wanna be politicians like Robert Harris also have a way to increase local food supply more by just coming up with a magical number of 20 to 30% but somehow forgot to talk to the current farmers about how this will happen. I guess an act of god will magically solve this problem or maybe more millionaires will come to our state and grow our food for us. Once again, the politicians are all about problem solving and going after biotech foods is going to give us more farmers and more local foods somehow. With so much more GMOs in our food supply, we shouldn’t be surprised of some eye opening statistics. Many anti-GMO activists keep claiming that GMO foods are killing us with all kinds of diseases but amazingly the people who eat this the longest are living longer! It’s estimated that by 2030, 25% of the population will be over the age of 65, and Hawaii will have the largest population of 80 year olds in the nation! Yup, those GMO foods are indeed killing us all and making us live long lives. As a result of this growing elderly population, more families are having to lose hours of work or quit work all together to take care of these folks. It’s not easy work taking care of an elderly person and raising your own family at the same time. I know because I’ve been doing this for over 8 years already and so many others are in the same boat as me. The cost of care is going up so families have to sacrifice much to care for their kupuna and we lose out on our own retirement savings. There are thousands of families doing this across our state and it takes a toll on each and everyone of us who are caregivers but the politicians are always looking out for us. They are going to work on labeling those GMOs so that we have more expensive food and lose more income from being caregivers. That’s a real priority to them. I mustn’t forget that there are some wealthy people in Hawaii doing good like Pierre Omidyar, who is trying to get local people more fresh milk. It’s too bad that the very people he catered to with Mao Organics are now the same ones who are fighting his investment in the Kauai dairy. Rich people also have plenty of money to sue to stop the dairy but then offer nothing in terms of growing Hawaii’s local food supply. It’s funny how the anti-GMO folks love their organic foods and then turn against the same person who provided more of those organic foods that they are demanding. These people have no allegiance to anyone for that matter and that’s what we are seeing. With all the money flowing into our state with the anti-GMO, anti-ag issues, why can’t that be used more constructively to help address the real priorities at hand? We have so many of them and yet our politicians want to regulate something that truly shows no evidence for enacting such legislation. These rich folks are spending lots of their monies to take away from the local folks who don’t even pay attention to what’s going on. Their gambling and tinkering in our state is really going to come at a big cost as it takes from each and every person who contributes to our state. As someone with lots of money, wouldn’t you want to give it to something useful rather than use it to take away from us local folks? It’s sad that our politicians can’t even see that either. Every time they support bad legislation, it takes away from our keiki, kupuna, and all local people and we all lose because someone had a lot of money to waste.